I was planning on writing a blog post on the potential of close to 40+ railway stations being completely rebuilt via the fifty level crossing grade separations the state government is intending on doing over 8 years — most of which are adjacent to railway stations. But last Thursday night’s PTUA member meeting with Ian Woodcock, who has studied this in some detail, somewhat stole my thunder. Integration with surrounding urban form is really important. Shops, businesses, “destinations” are vital. But his big idea was to consider elevated rail. He says it’s cheaper than trenches (the default method of grade separation) — about 1/3 of the cost. It allows more places to cross the line, and in fact can make use of the land underneath — something which is generally not economic with trenches. It’s also operationally cheaper — trains can slow down coming up the hill into a station, and have gravity help them accelerate away as they depart. 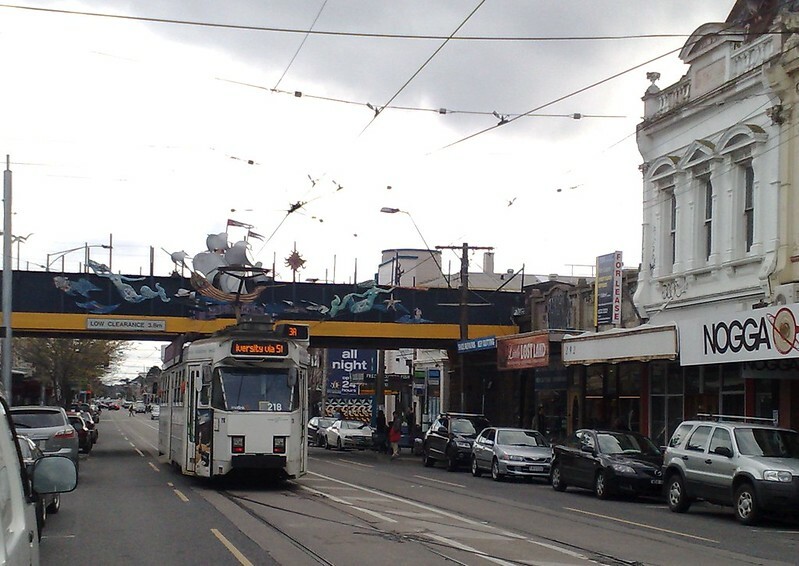 There are old examples of elevated rail working well with the urban landscape, such as around Glenferrie station, providing good proximity for the station to the connecting trams and the shops and the university around it. Canterbury, Balaclava, and others also have elevated rail, though these were all developed many decades ago. A more modern (Australian) example is the Sydney North West rail link, much of which is elevated through parks and suburbs. I think he’s got a point. Elevated rail may be the best solution in some cases, and it doesn’t have to be ugly or impinge on the community if it’s done well. The cost difference alone — saving up to two-thirds — should have authorities carefully considering where it can work. For some examples, see these designs on the ABC web site: Dream train stations designed by Melbourne students. Vicroads had an information tent for the North Road level crossing grade separation, at the Ormond traders festival a month or two back, and I also had a brief chat about it with local MP Nick Staikos about the same project when I ran into him one Monday morning at Bentleigh station. As was already known from the information they have put out, the project is set to start major construction in 2016, with major works including a complete rail shutdown for a month in the 2016/17 Christmas holidays. What’s interesting is that Vicroads said, and Nick confirmed, that they are studying whether they can do the Mckinnon and Bentleigh crossings at the same time. This makes a lot of sense; the latter two are less challenging, narrower roads, and it would minimise the rail closures and costs. Vicroads said they are hopeful, but it’s subject to the state Budget funding the extra two crossings. If I were Nick I’d be pushing for it, as if they can finish them all well before the next state election in 2018, it’s a better look for him being re-elected than if the job’s only half done, the stations are piles of rubble and replacement buses are running every weekend. I guess we’ll see tomorrow (Tuesday; State Budget day) how many level crossing removals get full funding — as well as what other projects, such as Mernda rail, go full steam ahead. Update: The State Budget provided funding for 17 crossings, including Mckinnon and Centre Roads, and the 9 crossings between Caulfield and Dandenong. Update 19/5/2015: Sure enough, the government has announced the contracts have been awarded for these three, as well as Burke Road. All four will be rail under road. oh that’s Carlisle Street Balaclava. The station where a huge wad of cash was found under the platform, and another one the next day. I loved that. Add to the economy of them that elevated rides are more pleasurable for the passenger than subterranean and it’s no contest really. elevated doesn’t get flooded either. Presumably trenches have been used as a default because rail bridges are often ugly? Rail bridges aren’t necessarily a bad idea – by default they can be pretty ugly things, but that’s a design consideration and therefore does not have to be the outcome. My main concern with rail over road is that if you remove 50 level crossings, you have 50 more chances for a truck to get stuck under a bridge – frankly, it happens too much already, and it’s just going to happen even more. I recently used the Brisbane Airport rail link, and it got me thinking about elevated rail as well. It’s certainly got its downsides, but certainly the ability to use standard components, and (presumably?) reduced groundworks must be of some benefit. Also, greater scope for pedestrian/cycle permeability, away from just the main road crossings. Noise would also be a concern, but I wonder if there aren’t ways to address that? Certainly there are parts of the inner east where building a bridge over every road would more-or-less be a defacto elevated rail line. I’m also hoping that the massively over-designed (but still wanting in usability) RRL stations aren’t used as a template for these new stations. This map is provided on the dtpli website that shows the location of each crossing to be removed. There are several types of elevated rail. The older brick archway viaducts, the steel framed ELs similar to the Chicago “L” and the modern grey concrete elevated railway similar to NWRL in Sydney. Modern elevated railways do not blend into the streetscape as the older viaducts and are generally considered unattractive. The Edwardian railway stations at Glenferrie station and Auburn station are viaducts. The station also incorporates street facing shopfronts into the design . The stations have an architectural value and are heritage listed. The Flinders street viaducts are similar and modeled on similar viaducts in the UK. Another attraction for rail on viaduct is that it makes rail more legible, increasing further that advantage c.f. buses, with flow on effects to attractiveness for investment (commercial or residential) close to the stations/lines. Mandura line’s success is very much due to its clear visibility. I much prefer elevated railways to that of underground or trench. Mostly for what I get to see from the train window. I want to see more of the city. Why can we not just close off some of the level crossings. Especially where you have three or four that run alongside each other such as Caulfield to Oakliegh. Just elevate above one or two, and just close off the rest. ++ The visual problems. There is no reason why you can not make it as a local feature. There is no reason why you can not design or paint them in a way to make them attractive. Have vines growing over them or something. Why is the South Yarra – Footscray route not going to be elevated at least in some part? A good point. Better than burying them in a trench, out of site, out of mind. Personally I prefer underground rail or a railway cutting to limit the visual impact on a residential area. Politicians tend try to reduce cost when constructing infrastructure but this can lead to poor outcomes. But recently I was looking at the new Silver Line in Washington DC. The elevated railway stations on this line are quite a good example of a positive outcome in terms of elevated station design. And the advertisement for the Silver railway line features the Australian band ‘Architecture in Helsinki’ if anyone is mildly interested. Clearly with the most recent at grade stations like Cardinia Road costing around $50m we should be looking at either putting roads under or roads over wherever possible to avoid the massive cost of rebuilding stations. Warragul Rail Precinct including an road underpass, new bus interchange, pedestrian overpass, 200 carparks, 2 sets of traffic signals, and reloacting a historic building cost $26m by comparison. The recent springvale road projects by comparison are running at around $160m or a massive 6times the cost. We should be doing everything we can to retain and improve existing stations with road overpasses or underpasses representing far better value even if large amounts of compulsory acquisition is required. The fact is recent rail separations have cost a great deal due to station rebuilds, significant retained earth and rail occupation costs all which could be avoided with road under/over solutions. Grades alone lend themselves with road being done with around 5% limiting and rail resulting in 1%-2% grades which increases the large retained earth cost 3 to 5 times. Moving Rail up opposed to down will still incur large costs for stations, retained earth, and occupation costs. It will also likely add noise attenuation costs as projects like RRL and noise policy reviews have started setting new precedents in this regard. I think people need to distinguish between viaducts and elevated lines on embankments. All Victorian examples, except the Flinders St viaduct and the new RRL lines, are on embankments. An embankment has no difference in permiability to a cutting and adds no usable land under it. The modern requirements for privacy and sound screening would mean that all you’d see from a new high level line would be a wall. Modern elevated lines are more visually intrusive because they are higher. If you look at older elevated grade separations (West Richmond – Victoria Park, Balaclava, Burnley – Camberwell) the load bearing members of the bridges are largely above the rail level (technically known as through plate girders) – see Daniel’s photo of Balaclava. This reduces the depth of the bridge required under the track. The purpose of this was to substantially reduce the fill required for the embankments. Up to WWII earthmoving was expensive and slow. 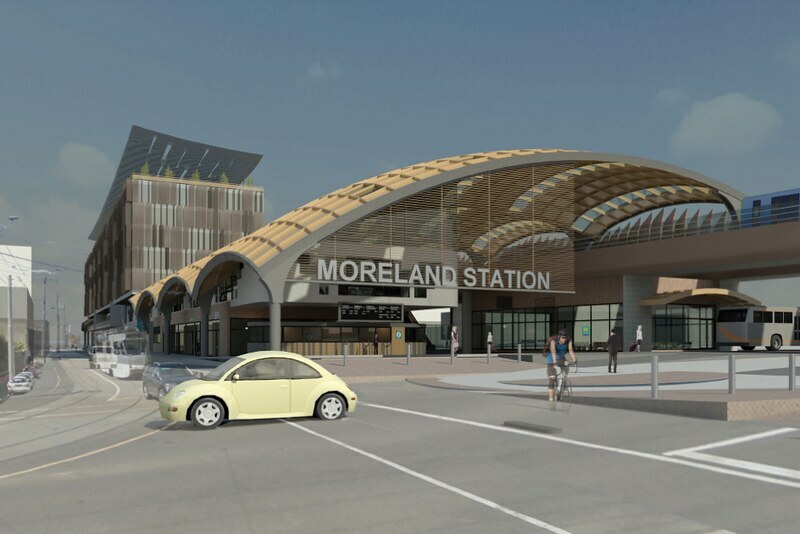 Modern elevated grade separations use post tensioned concrete beams that are underneath the track – see the picture of Moreland station. This significantly increases the depth required. I would also suspect that the road clearances have also been increased – making the track higher still. Trenched grade separation allows more trains to be run along a line. Tick. Trenched grade separation allows more cars to ‘cross’ (over) the intersection. Wrong. Because no doubt where a station is at grade with the road, pedestrian lights will be installed (like that proposed at North Rd). Typical boom gate down time is 45 seconds (20 seconds for lights, 25 seconds gate). Typical ped-xing is 20 seconds, however many more ped-xings will occur than trains intersecting, hence traffic will be ‘held up’ more (not by trains but people) with a trenched crossing than if it were at grade. By having the station elevated above the intersection peds could choose after alighting which side they wanted to be at. Alternatively, the station could be above the existing corridor (not over the road) and a walkway built which may be less intrusive. @Dave, the passenger really only has the choice if the station has been built with exits on both sides of the road. This is possible whether the station is above, or below the road (Nunawading being an example of the latter). Traffic is held up less minutes per hour by trains than by most intersections or pedestrian crossings, but the issue tends to be the lack of predictability, and the at times protracted closure of boom gates – there are plenty of documented examples of crossings being closed for 20+ minutes at a time. Interesting comments. The one thing that rarely seems to get a mention, yet I would think ought to be highly significant in any debate about public transport is the operating efficiency issue. Part of the logic for removing level crossings is operating efficiency – it allows road traffic and rail services to run without interfering with each other. This means trains can be timetabled for the most efficient and effective service distribution in relation to demand. It means far more trains can be run in the peaks. And it means that bus schedules are likely to be far more reliable, with road traffic flowing more freely, making it possible to create a genuinely effective, intuitive and usable inter-modal network. But in all this, the ability to make the operation of the trains as efficient as possible seems to get left behind. It uses far less energy, causes far less wear and tear, and minimises maintenance requirements if rail alignments can be arranged to utilise gravity to help with braking and acceleration. This consideration ought to play a far more prominent role in discussions about which grade separation option is preferable and why. Perhaps at a location where only a few services pass through it might be possible to give more weight to non-transport amenity issues, if they are pertinent. But since the highest priorities for level crossing removal are locations where there are both high frequencies of rail services and high road usage, then the weightings ought to be different. I’m also surprised that hydrological issues are similarly downplayed as mere technical problems, albeit with a cost attached. If there is any chance that a line, or a small section of it, could flood, that has serious implications for service reliability. While it may be possible to install pumps etc to reduce the likelihood of flooding, nothing is ever fail-safe. I would have thought that ‘operating efficiency’ would also imply that every step should be taken to ensure the maximum reliability of services while minimising energy usage, maintenance costs and so on. This isn’t meant to imply that the urban design impacts aren’t important – of course, they are, but we need to be nuanced in what we’re thinking about in that area also. Do we create a less efficient solution, with flooding risks, just because some people might think a technically superior solution could be ‘ugly’? Efficiency is objective; ugliness is subjective. Efficiency is something we can all understand and agree about; we may not all think the same when it comes to what some people think is ‘ugly’. Clearly, the supposed ‘ugliness’ of elevated rail has not negatively impacted on property values in places like Hawthorn and Canterbury, or Balaclava, and as has been pointed out, those embankments are not even very good examples of how well elevated rail can be done!